Custom made jerseys is something we can produce with the highest quality. We carry a full line of colors and styles for every sport. Utilzing most athletic apparel brands we can produce your custom made jerseys in no time. Our screen printing services are performed in house to ensure quality and to control turn around time. We can your custom made jerseys around in 10 business or days or less. Our 20 years of experience had allowed us to streamline our internal processes of how we produce jerseys quickly and effectively saving our clients time and money. Our personalized jerseys are a combination of screen printing and vinyl for the lettering and numbering. We can screen print numbers if you wish but those command a higher price. We cut and weed our vinyl to match any font you wish to give you a truly one of a kind looking jersey. Many custom team apparel companies outsource the printing or numbering services. This means your price is higher than it needs to be and the production time is longer. In this case cheap and quality are not the same. 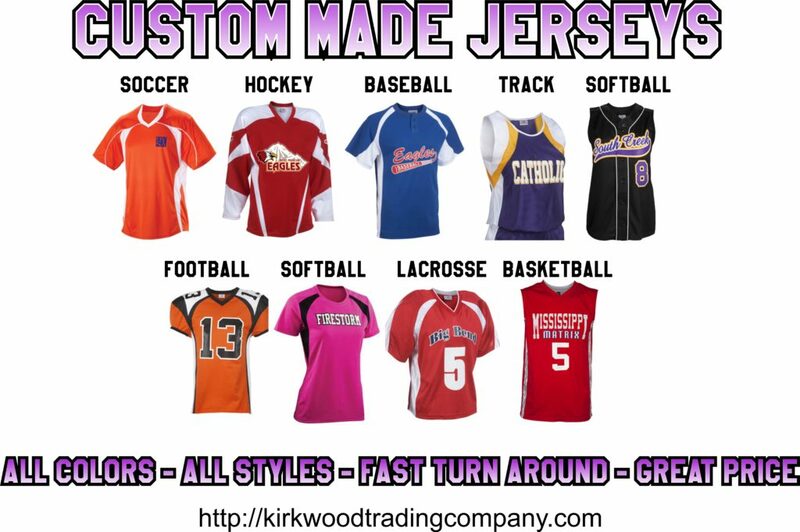 Kirkwood Trading Company is an experienced custom jersey maker and our 20 year history and repeat clientele are a testiment to our product and service. We stay ahead of the trends to give our clients a truly unique looking jersey when it’s sought. Many of our clients like the traditional looking custom made jerseys while other clients are looking for the newest trends to really stand out. Either way is fine with us as we offer both styles from a variety of manufacturers. We specialize in soccer jerseys, hockey jerseys, basbetball jerseys, baseball jerseys, cheer uniforms, lacrosse jerseys, softball jerseys, football jerseys, track jerseys, and some others. These are the most popular requested jerseys. If you’d like a free price quote on your custom made jerseys or team apparel give us a call. You can contact us directly through this link. In addition to jerseys we also specialize in custom team apparel. We can set up free online stores where you can sell your logo wear to your fans or parents. We build the store, put products only you request on there with your designs. Kirkwood Trading Company handles the order processing and shipping if required. You simply collect the profits.